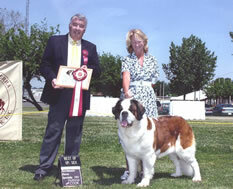 The Saint Bernard is a powerful, proportionately tall figure and is strong and muscular in every part of its body. It has a powerful head and most intelligent expression. In dogs with a dark mask the expression appears more stern, but never ill-natured. Like the whole body, very powerful and imposing. The massive skull is wide, slightly arched and the sides slope in a gentle curve into the very strongly developed, high cheek bones. Occiput (back of the skull where the notch is located, just above the cervical spine) only moderately developed. The supra-orbital ridge (above the eye socket, on a human this area is where the eyebrows are located) is very strongly developed and forms nearly a right angle with the long axis of the head. Deeply imbedded between the eyes and starting at the root of the muzzle, a furrow runs over the whole skull. It is strongly marked in the first half, gradually disappearing toward the base of the occiput. The lines at the sides of the head diverge considerably from the outer corner of the eyes toward the back of the head. The skin of the forehead, above the eyes, forms rather noticeable wrinkles, more or less pronounced, which converge toward the furrow. 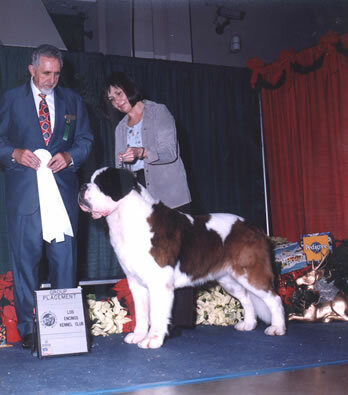 Especially when the dog is alert or at attention the wrinkles are more visible without in the least giving the impression of morosity. Too strongly developed wrinkles are not desired. The slope from the skull to the muzzle is sudden and rather steep. The long-haired type completely resembles the short-haired type except for the coat which is not short-haired (stockhaarig) but of medium length plain to slightly wavy, never rolled or curly and not shaggy either. 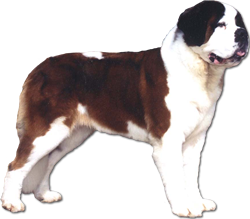 Usually, on the back, especially from the region of the haunches to the rump, the hair is more wavy, a condition, by the way, that is slightly indicated in the short-haired dogs. The tail is bushy with dense hair of moderate length. Rolled or curly hair, or a flag tail, is faulty. Face and ears are covered with short and soft hair; longer hair at the base of the ear is permissible. Forelegs only slightly feathered; thighs very bushy.